Summer Vegetable Salad with Charred Lime Vinaigrette is the perfect side dish for all of your summer meals! Summertime is the best time! Summer is my favorite time of year because I love all of the fresh produce that is available. I can never get enough! I try to eat as many fruits and vegetables as I can every single day so I can enjoy all of the flavors of summer. I love this Summer Vegetable Salad because it is packed with so many summer vegetables. I get to enjoy all of my favorites in one salad! This salad recipe comes from Gail Simmon’s new cookbook, Bringing It Home . I am obsessed with this book! 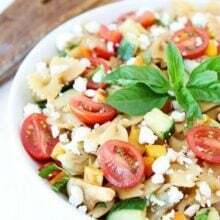 There are SO many recipes I want to make and this Summer Vegetable Salad is already a favorite. I know I am going to be making it all summer long. Make sure you check out the cookbook, it’s a good one! So what’s in this special summer salad? Yes, you read that correctly, a charred lime vinaigrette. Charring the limes for the dressing is genius! Grilling the limes before juicing them gives the salad a delicious charred flavor and it makes the limes easier to juice. A win-win! I love that the vegetables are grilled, grilling adds the best flavor and you can’t beat grilling out during the summer. We like to spend as much time outside as possible. And if you don’t have a grill, don’t worry, you can use a grill pan inside. That is fine too! 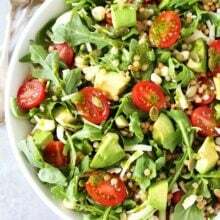 This salad is very flexible too, you can use whatever summer vegetables you have on hand. The more the merrier! If you want to bulk up the salad to make it more of a main dish, feel free to add your favorite protein-chicken, steak, fish, or beans would be great! And if you have avocado, add it! Avocado is always a good idea! 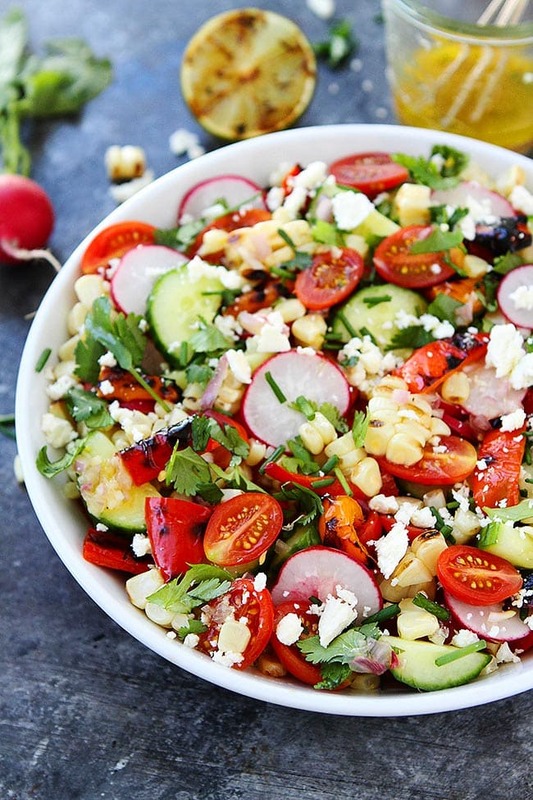 Enjoy this easy summer vegetable salad all summer long! It is great for lunch, dinner, or for summer BBQ’s! This simple summer vegetable salad is full of flavor and a great side dish to any meal. Prepare a grill or grill pan for medium-high heat. Brush the corn and bell pepper with oil and grill, turning occasionally, until charred and tender, 6 to 8 minutes for the pepper and 12 to 15 for the con. Transfer the grilled vegetables to a cutting board as they are finished and let cool slightly. Brush 3 of the lime halves with oil, you won't need the 4th half, save for another use. Grill the halves, cut side down, rotating occasionally, until charred, about 5 minutes. Transfer the limes to a plate. To make the vinaigrette, thinly slice the garlic, then mount the salt on top. Using both the blade and flat side of a chef's knife, chop and scrape the mixture into a paste. Transfer to a small bowl or jar. Juice the grilled limes and add the lime juice and shallot to the bowl with the garlic and whisk in the oil. Cut the corn kernels from the cobs and roughly chop the bell pepper. 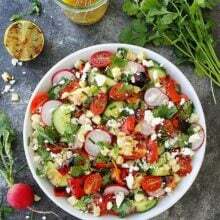 Arrange the grilled vegetables, tomatoes, cucumber, and radishes in a large bowl. Add the vinaigrette and a generous pinch of salt and pepper; gently toss to combine. Sprinkle with the cheese and herbs to serve. Notes-you can keep the vinaigrette in the fridge for up to 1 week. 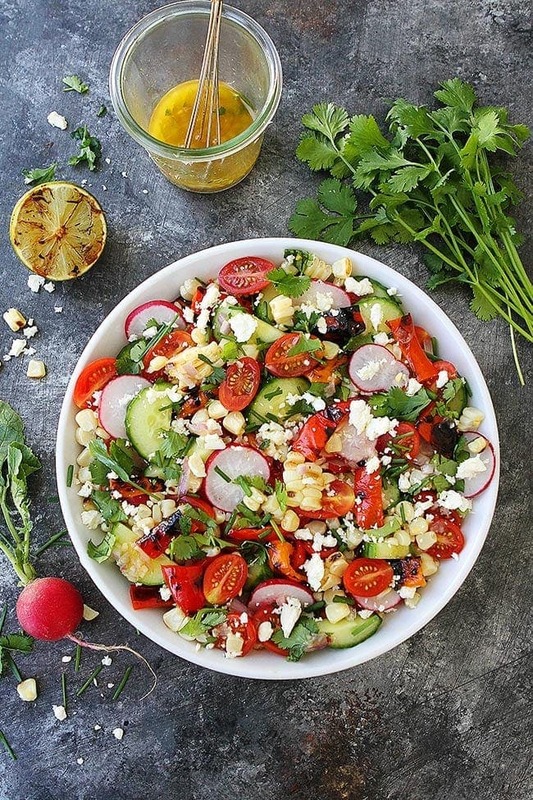 Looks perfect for a summer salad! How do you char the lime? Thanks, I updated the recipe to include the vinaigrette instructions. There is no info on charring the lime! Oops, I updated the recipe! Sorry about that! One of the best thing I like to eat as I’m vegetarian… So I really love this salad and almost eat it minimum three times in a week… I add few other things to this for making a different taste as I make a soup sometimes with these things. If this isn’t a summer staple, I don’t know what is! seems very healthy and tasty, i always have salad either before having meal or later. Thanks for sharing good healthy recipe. In summers we can find lots of fresh fruits and vegetables. I prefer to eat lots of raw vegetables in summers as they refresh and hydrate us. The salad is just awesome. 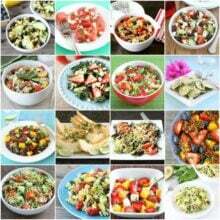 I include salad in all meals, they are healthy and make the meal more tasty. 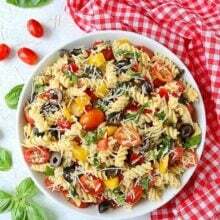 We take salad without cheese but this time I will try your recipe with lots of cheese. Just made this. Substituted garden zucchini for the cucumbers and did a combo of lemon and lime. 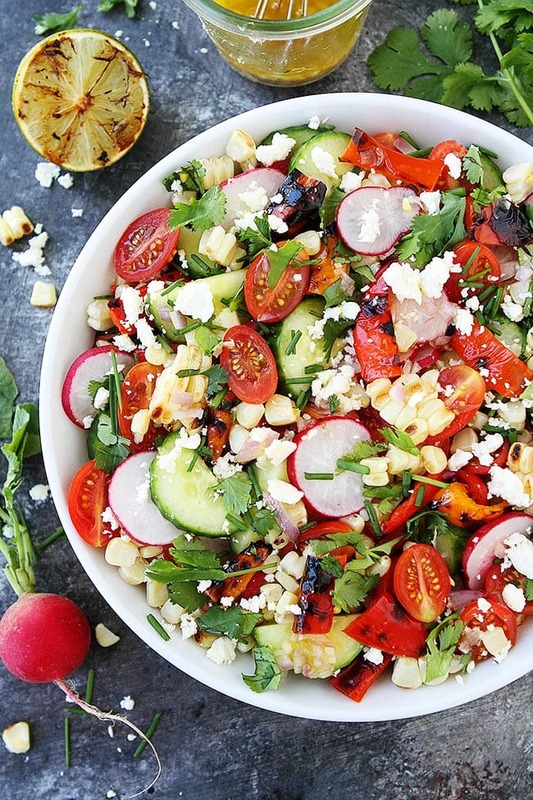 Beautiful, healthy, tasty salad that will be on a regular summer rotation in our house. Did I just miss the Nutrition Information or was it not posted?